Just writing 1.4 billion doesn't work. To visually understand how big this recent leak of data was, you really need to count slowly the zeros on the title of this post. That's data that anyone with some time will be able to find. It is not awfully recent, it is from about 2016 and most of the major websites such as google, linkedin, dropbox and similar have already forced their customers to change the password they were using. Still, (and this is a big still), The amount of information that you can extract from this database with 1400000000 user accounts is simply gigantic. The potential for misuse and abuse is there. Passed a good part of last week looking at the data, cleaning up the records and verifying their authenticity. This data is real, even my mom had her password listed there. Some cases were just weird. While looking up for the name of a known criminal as test, the first match indicates that he had an email account with a very small email provider in Switzerland. In other cases such as the accounts from domains belonging to football clubs, the large majority of these passwords included the name of the football club inside them (e.g. "benfica1"). One of these clubs had recently passed through problems as their emails got leaked to public. After looking at their password practices, I can really understand why it wasn't that difficult to guess them. What seems more troubling is the amount of people using their company emails for registration in external sites. Certainly in many cases it is a necessary action, can't stress enough that this type of thing should be avoided as much as possible. Change your passwords and use two-step authentication when available. My friends, stay safe out there and all the best for this 2018 that now starts. Good point. I wonder how many people will really use a password manager. 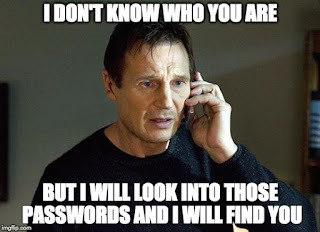 Even so, wouldn't the password manager also be possible to attack by bruteforce and password guessing? From that perspective, assuming my laptop has a keylogger installed then the keylogger would be able to track the master password and then access everything. Whereas today one can still use human memory to store a few passwords. Hm, not easy of a choice.